This seems to be men's week on the Forest City Fashionista, which is rather surprising, given that London is not known for its stylish male population. Perhaps it's luck, or, I've discovered where all the well-dressed, attractive men hang out (that would be either the Market, or on Talbot Street). 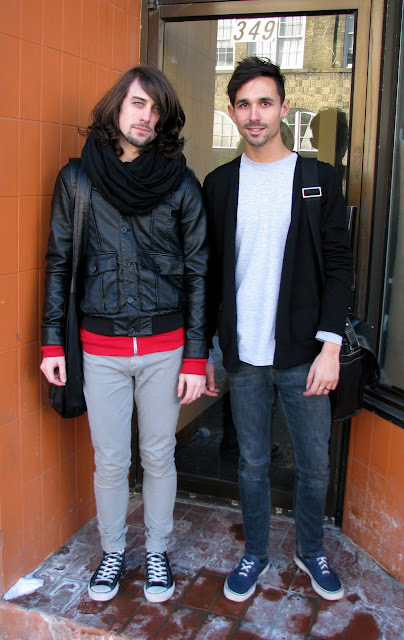 These two were doing some shopping at From Mars, when I pulled them out into the cold to take their photo. I like the whole look, from the hair, to the oversized shoulder bags, to the shoes. Looks good, but how are they not freezing their nuts off?